1) Go to www.mapmaker.donkeymagic.co.uk This will bring up a map of the UK but don't despair, just drag the map until you reach North America. 2) Center Northwestern Ontario on the screen and zoom in. We suggest using the "Map" selection( buttons on the top right of the map) until you locate your area and then switch to "Hybrid". This will give you a satellite image with some lake and town names. 3) Keep increasing the scale and centering on your location until you get the maximum resolution you can. 4) Point your cursor to your exact location on the image where you are located and click. 5) Now look under the title "Add Marker" on the left side of the screen and you will see your exact latitude and longitude co-ordinates. 6) Copy these long numbers and e-mail them to ruth@freemap.ca to relocate your marker to the correct spot on the map. Every member gets one free icon at the location of their choice on the map for each separate ad they have placed on the printed map. If you wish to have an icon for all your locations (i.e. outposts), they are available for $25.00 per icon per year. To do so, contact me and arrange to have them added. Our newly redesigned website is up and running. Please check it out as we think it is really great! Although you may find some minor errors - don't worry. We're on top of it and double checking everything so it will be in tip top condition. We are asking that you go on and check your listing for any errors. If you find anything, please let us know. We've combined all the information found on heartland.on.ca and freemap.ca into one great new site. Some of you will have read in the December Newsletter that we were working on adding a section in your website listing that would allow for the Posting of Testimonials. The benefit of having your testimonials (and the content contained therein) posted on our websites, is that it will increase the quantity and quality of visitor traffic to our sites. Therefore, this should also increase the subsequent visitation to your own sites through the weblink. testimonials by manually inputting them, or simply cutting & pasting them into the designated field. Should you require assistance don't hesitate to e-mail Ruth (ruth at freemap.ca) or give our office a call. site, just let us know by February 05. Protecting our waters from unwanted introductions of Aquatic Invasive Species (AIS) is a priority for the Department of Fisheries and Oceans (DFO). A major route of introduction for AIS is by hitch-hiking on trailored watercraft. 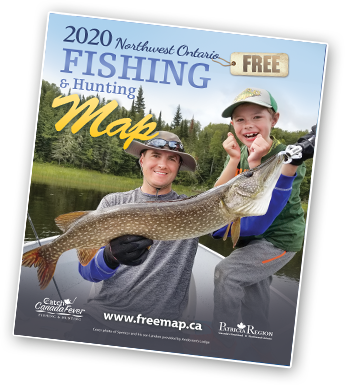 Starting in the summer of 2007, DFO has initiated a monitoring program to help prevent the introduction of AIS into the Rainy River / Lake of the Woods region. Watercraft inspectors will inspect trailered watercraft for AIS: Zebra Mussels, Round Goby, Rusty Crayfish, Spiny Water Flea, and the aquatic nuisance plants; Eurasian Water-milfoil and Black Algae. The watercraft inspectors are working in conjunction with the Canadian Border Services at the international borders in Fort Frances and Rainy River. They will also have a visible presence at local events and fishing tournaments. DFO is asking that boaters stop for a quick AIS boat inspection and short survey. Help protect our lakes and rivers from unwanted introductions of Aquatic Invasive Species!